The MHS Board meets the third Thursday of the month at 9:00a.m. Pratt Hall in the su mmer, Public Safety Building Conference Room in the Winter. 1. What year was the first road paved in Vermont? 3. 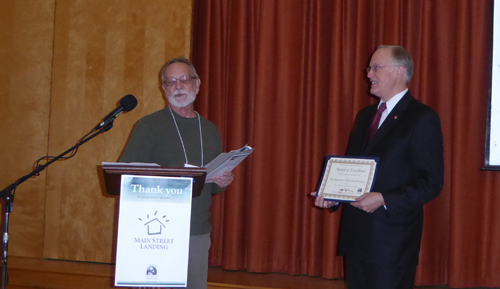 Montgomery now has nine places on the National Register of Historic Places (NRHP). About how many NRHP sites are in VT.
4. How many NRHP sites are there in Franklin County? 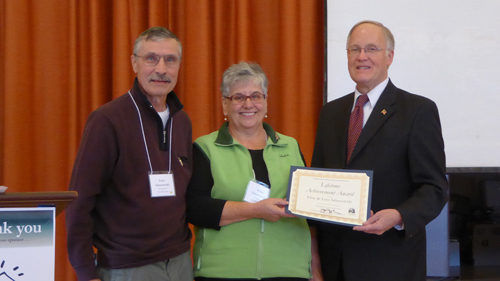 This year's League of Local Historical Societies and Museums (LLHSM) Annual Meeting in Burlington was one of the best yet. 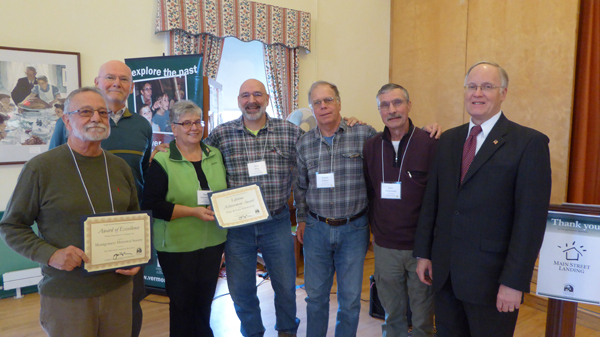 Partly because of the awards we received recognizing our excellent work, and a lifetime of sustained contributions of Elsie and Lutz Saborowski (see photos below); but also because of several excellent presentations; from non-profit fundamentals to putting together walking tours. The key note speech was delivered by Stuart Comstock-Gay of the Vermont Community Foundation, who talked about what sociologists term as Social Capital and the role that organizations like ours play in fostering it in communities. According to a short paper by Robert D. Putnam ""social capital" refers to features of social organization such as networks, norms, and social trust that facilitate coordination and cooperation for mutual benefit." Putnam noted a decline in civic engagement in the U.S. and studied the fall in participation in a number of social contexts including a decline in bowling leagues even though non-league bowling increased. Along the the way he and others studied impacts. Did you know that joining and participating in an organization correlated to the same increase in health as quitting smoking? The impact of social media and other digital technology on Social Capital are still being debated. This link is to the Putnam paper which is a fascinating read. Gay ended by applauding all of or our efforts and urging us to consider the importance of this indirect (not explicitly specified in our Mission) result of our work. Sitting there I couldn't help but think about the MHS and the many other groups we have in Montgomery from the Fire Department, to the Grateful Treads, to the various committees and commissions, and local government and school. I also thought of the latest chapter in the Town history written by Jo Anne Bennett which echoes the same sentiment. I think we have a lot of Social Capital. We can always use more. Perhaps we should build a bowling alley! Thanks for your support. from former Governor Jim Douglas. 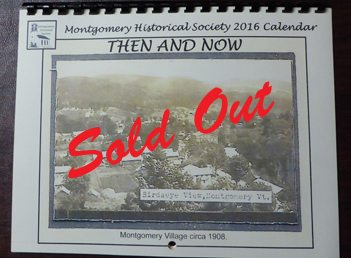 for supporting Montgomery's heritage and history. Montgomery Historical Society delegation with Gov. Douglas. Every two years since 2012 we've published a "Then and Now" calendar sharing some of our archival photos and the corresponding view today. They are a bargain at just $15 and available at Lutz's, the Town Office and on our website for a limited time only. We participated in a local craft show organized by our own Sue Wilson in early December to benefit the Montgomery Elementary School. 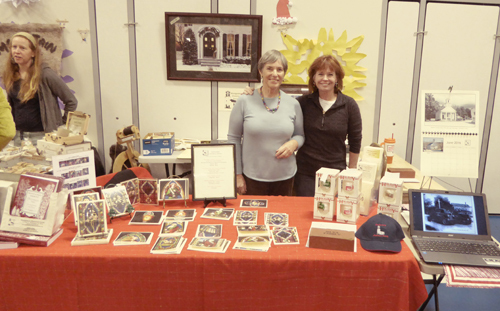 We offered books, calendars, vintage covered bridges ornaments and stained glass window note cards. Can't get more local than that! Marijke Dollois and Susan Baddorf staff the MHS booth. Thanks to all of you for helping us achieve our annual membership goals of 200+ memberships and over $10,000 in membership dues donations for 2015. We are humbled by your support . We are 43 years old and going strong! 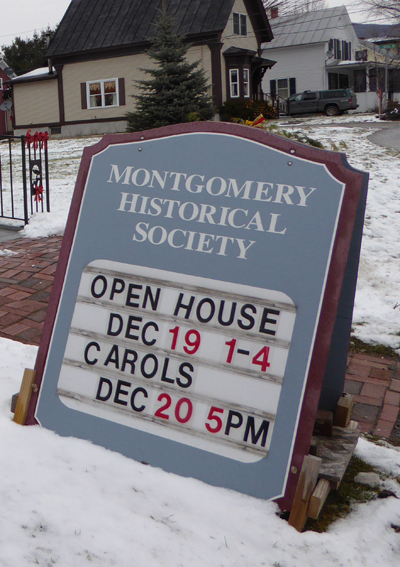 About two dozen adults and children stopped by during our Open House on December 19th to take in the decorations and enjoy cookies and cider. Invariably we have a few people, including locals, who have never been in the building so impromptu tours break out. Many were also eager to see the final results of the West Wall project. Nearly 120 people crammed into Pratt Hall on December 20th for our first Candles and Carols sing-along since 2012. 2013's was canceled by the ice storm and 2014's construction forced another cancellation. Steve Hays took on the musical lead, Suzanne Dollois told a story that explained why evergreen trees get to keep their leaves for winter, and Scott Perry related the story of Randolph the Bread Nose Reindeer. Titus Pressler's (the younger) interpretation of "five golden rings" was exquisite! Matt Crowley's goose a laying needed work!! We were joined by about 15 students from Peru and Indonesia attending a student exchange program affiliated with Jay Peak. Their enthusiasm made up for any language short comings and they took a lot of selfies with the decorations. 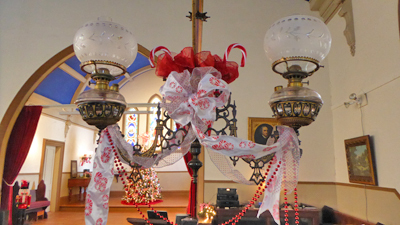 Thanks once again to Steve, Suzanne, and chief decorator, Noela McGroarty. 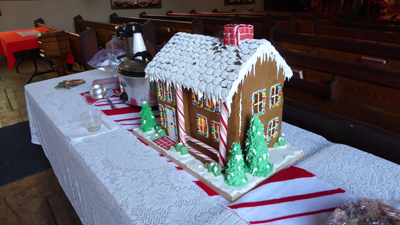 Also to Sam Murphy for the wonderful gingerbread house we gave away to a lucky winner! We even had a little snow!! 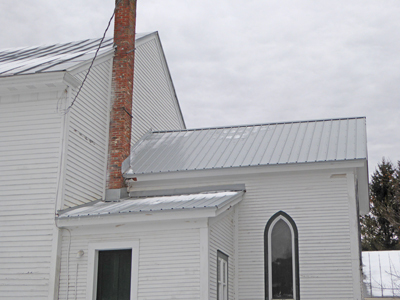 Rob Barnard finished the new metal chancel roof in November, culminating our work on Pratt Hall for 2015. In 2016 we hope to do the final prep and painting of the West Wall and do some high work on the clock molding and bell section louver moldings. October: 1864 - St Albans Raid. November: 2015 - Former Baptist Church officially put on the National Register of Historic Places by U.S. Dept of Interior. December: 1944 - VT basketball federation adopts rule changes allowing 5 instead of 4 fouls, and unlimited substitutions.